Coffee, tea, sandwiches and iced drinks. Costa Coffee was founded in London in 1971 by the Costa family as a wholesale operation supplying roasted coffee to caterers and specialist Italian coffee shops. Acquired by Whitbread in 1995, it has since grown to over 3,277 stores across 31 countries. The business has 2,121 UK restaurants, over 6,000 Costa Express vending facilities and a further 1,280 outlets overseas (including 395 in China). Italian Immigrant brothers Bruno and Sergio Costa founded a coffee roastery in Lambeth, London, in 1971, supplying local caterers. The family had moved to England in the 1960s. Costa branched out to selling coffee in 1978, when its first store opened in Vauxhall Bridge Road, London. In 1985, Sergio bought out Bruno's share of the company. Bruno went on to found a tableware company. By 1995, the chain had 41 stores in UK. In 1995, the business was acquired by Whitbread, UK's largest hotel and coffee shop operator, becoming a wholly owned subsidiary. In 2009, Costa opened its 1,000th store - in Cardiff. In December 2009, Costa Coffee agreed to acquire Coffee Heaven for £36 million, adding 79 stores in central and eastern Europe. As well as high street locations, Costa Coffee outlets can be found in airports and within Waterstone's bookstores, WHSmith, Homebase branches, larger Next stores, Marriott Hotels, Odeon Cinemas, some Premier Inn Hotels, Waitrose, Debenhams and Tesco stores, Pizza Hut branches, Beefeater pubs, Moto and RoadChef motorway services and in some hospitals and the Manchester Primark. Smaller sub-units are also set up in railway stations and airports throughout the UK. Many of Costa Coffee's branches located in airports, cinemas and hospitals are either individual or corporate franchises. 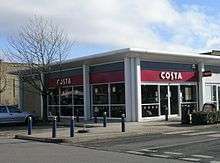 Costa Coffee also has small outlets positioned on out-of-town business parks, often among other food retailers, and on-site at various businesses. Costa Coffee currently has branches in many countries. Following Whitbread's £59.5m acquisition of Coffee Nation, a chain of coffee machines, the machines were re-branded as Costa Express. The company plans to expand to target hospitals, universities and transport interchanges. These coffee bars will use the same coffee beans as used in Costa stores and will use fresh milk. On February 29, 2016 Costa announced a partnership with Shell Canada to distribute 150 Costa Express machines throughout its Canadian petrol stations. Coffee served in a Massimo cup. Costa Coffee has its own roastery. The blend served in retail stores is their own "Mocha Italia"; it contains a blend of arabica and robusta. Costa Coffee employs Gennaro Pelliccia as a coffee taster, who had his tongue insured for £10m with Lloyd's of London in 2009. Costa Coffee has its own loyalty scheme that is called the Costa Coffee Club. Using a Loyalty card or an app for Android phones or iPhones, members may gain points which allows them to get free coffee and other goods. Points are added whenever a purchase is made, and the card or app is presented and swiped or scanned. Costa Coffee has been the sponsor of the Costa Book Awards (formerly the Whitbread Book Awards) since 2006. ↑ "Costa Coffee founder: My hometown Purley has too many coffee shops". Croydon Advertiser. 16 October 2012. Retrieved 15 February 2015. ↑ "Costa Experience - The Journey from Bean to Cup - Costa Coffee". Costa Coffee. Retrieved 6 April 2014. ↑ Adams, Guy (2 May 2013). "The man who founded Costa Coffee - then sold out for a fraction of its value now - insists he's not bitter. So... WHY does Mr Costa refuse to drink his own coffee?". Daily Mail. Retrieved 15 February 2015. ↑ "Costa - Our History". whitbread.co.uk. Whitbread. Retrieved 15 February 2015. ↑ Nick Fletcher. "Flat white froths up Costa Coffee's fortunes". the Guardian. ↑ "Whitbread annual report 2015/16" (PDF). Whitbread. ↑ Emirates, Mall of the. "Costa Coffee in Dubai, Mall of the Emirates". 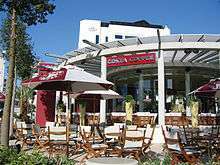 ↑ "Park View Shopping Centre - Costa Coffee". ↑ "Homepage". Costa Coffee. Retrieved 3 August 2012. ↑ Zoe Wood. "Coffee Nation – fast, fresh and £2 a cup". the Guardian. ↑ "Costa Coffee on Twitter". Twitter. ↑ "Costa Coffee taster: Ten of the weirdest insurance policies". Telegraph.co.uk. 9 March 2009.